Los Angeles area has a pleasantly sunny climate with low humidity throughout the year and average temperature of 21C. Only in Los Angeles you can ski in the morning and surf in the afternoon. Los Angeles attire is casual with layered approach. Hot in afternoon and mild temperatures in the evening. 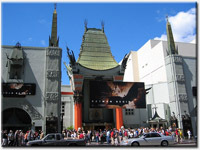 Main Los Angeles attractions include: Hollywood Walk of Fame, Sunset Strip, Rodeo drive in Beverly Hills, Santa Monica Pier, Hollywood Bowl, Venice Beach and canals, Getty Museum, Universal Studios Theme Park, Disneyland, Staples Center, The Grove and Farmers Market. Main Los Angeles activities, sightseeing, surfing, skating, bicycling, golfing, hiking, sports events and concerts, clubbing.